Brides, grooms and their guests can really make the most of a destination wedding in Thailand by also taking part in some of the adventure activities on offer on islands like Phuket and Koh Samui. Many couples travel thousands of miles to Thailand for the most important day of their lives. For this reason, they also choose to tie in their wedding celebrations with an extended vacation. Thailand is known for its balmy climate and idyllic beaches, but some visitors are not content to while away their days in the Land of Smiles relaxing on a sun lounger. Indeed, an increasing number of wedding couples choose to take part in some of the more daring activities place like Phuket and Koh Samui have to offer. Whether its Bungee jumping, ATV rides or paintball; for travellers in the mood to do more than sunbathe and drink cocktails, all offer a chance for couples and their guests to get the adrenaline pumping. One of the best ways to explore the varied terrain and tropical surroundings on islands like Phuket or Samui is on the back of an ATV (All Terrain Vehicle). It’s also a great way for couples and their guests to add a little off-road adventure to a wedding trip to Thailand. Quad biking tours tear across bumpy off-road trails and take riders down narrow, winding paths, ploughing across any obstacles in their way. 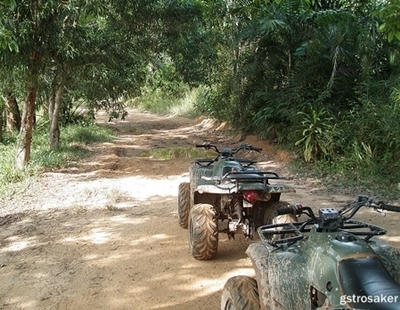 ATV tours also take in the magnificent jungle scenery as well as dramatic views of the coast. Typically, tours include transfer to and from your place of accommodation, as well as refreshments. While paint-balling in the cold, damp climate of Europe can be a miserable experience for all but faithful followers of the genre; paint-balling in the warmer climes of Thailand is a lot more fun and a great way for couples to explore each others character before they tie the knot. Paintball offers the chance to show your courage, apply your cunning and test your tactical battle skills. 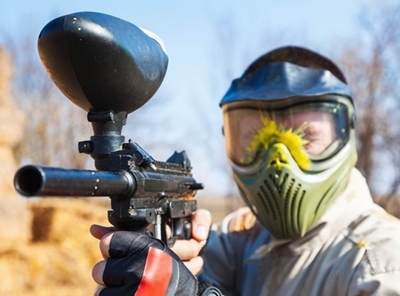 Thailand’s two most popular islands are both home to popular paintball centres, where visitors can engage in paint warfare deep within the island’s tropical jungle surroundings. Equipment rental and insurance are generally included as part of the package, and transfers to and from hotels or villas are also provided. 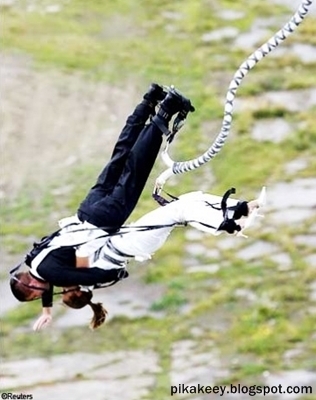 As well as being extremely popular for destination weddings, Phuket and Koh Samui also have their own bungee jump sites, which offer couples the ultimate pre-or post-wedding adrenaline kick. Set over a small lake surrounded by abundant tropical vegetation, Phuket’s Jungle Lagoon in Kathu challenges the nerves with a 50 m drop, while for couples getting married on Koh Samui, Samui Bungee Jump offers up a similar test, with a plummet toward Southern Thailand’s deepest swimming pool. Couples with a need for speed may also enjoy zip-lining through the splendid surroundings of the islands’ jungle scenery at speeds nearing 50 miles per hour. With Canopy Adventures Thailand (also located in Pattaya), visitors can explore Koh Samui from a different perspective by flying from platform to platform, deep within the jungle. On Phuket, Flying Hanuman offer a similar thrill just 8 km form the main tourist town of Patong. 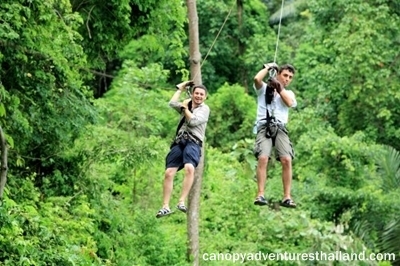 For nature seekers, zip lines also offer a great opportunity to catch a glimpse of some of Thailand’s local wildlife, and refreshments and hotel/villa transfer is usually included in the tour. Over the past two decades, Thailand has established a reputation as one of the world’s top locations for scuba diving. The seas surrounding islands like Phuket and Koh Samui are rich in marine life, with exquisite coral reefs and striking undersea rock formations. For visitors who have never tried diving before, it is possible to gain the necessary P.A.D.I qualification at one many certified dive schools. 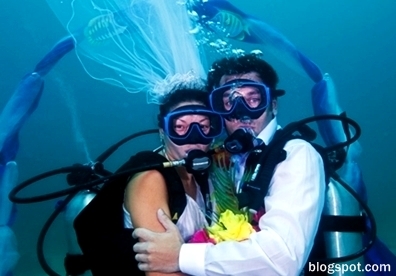 Some couples who want to go all out with the adventure wedding theme may even choose to tie the knot beneath the surface – underwater ceremonies can be arranged through good wedding planners.